In a dramatic follow-up to the ‘no bill’ application made by Stephen Murney’s legal team on Tuesday 26th November, the judge hearing the case summoned the defence and prosecution teams to a brief sitting yesterday evening (Friday 29th November). Although he had previously stated that judgment was being reserved until December 10th, the judge announced that he was dismissing those charges relating to “items for use in terrorism”. These charges related to old band uniforms of Stephen’s and to toy guns belonging to his son – facts that had been consistently presented by the defence ever since Stephen was first charged exactly one year ago. The charges featured heavily in every court hearing during the past twelve months as PSNI witnesses and the prosecution, constantly and without fail, portrayed these “terror” charges and the items they related to as some sort of evidence to show Stephen’s involvement in a “terrorist conspiracy”. Far from accepting that the items were, in fact, band uniforms and toys, the prosecution continuously referred to “paramilitary uniforms” and “Uzi machine guns” that could be used in “paramilitary shows of strength”. This Saturday, 7th December, the Sean Heuston Society are hosting a lecture on the formation and activities of the Irish Citizen Army. This will take place at 1pm in the National History Museum, Collins Barracks. This event is free of charge and non-party political. 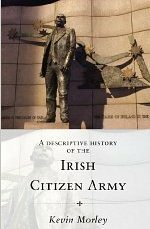 Kevin Morley, author of A Descriptive History of the Irish Citizen Army, will be main speaker. Also they will have a descendant of Michael Mallin, who’ll be talking about modern-day revisionists who attempt to apply 21st century standards to men and women born in the 19th century.